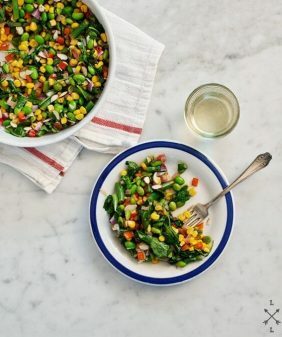 Chilled crunchy summer veggies are tossed with herbs and a spicy, tangy curry coconut dressing. Serve it for a vegan weeknight dinner as a main or side. I could eat coconut all day in the summertime. Cold, crunchy, spicy salads like this one with a side of coconut iced tea, followed by coconut ice cream for dessert. I ask you, who needs so much dairy when the coconut exists? (Ok, don’t answer that, I know you cheese-lovers are a passionate bunch). Coconut milk, lime, and red curry are flavors that I am crazy about… and here they create a delicious and creamy contrast to the crunchy chopped veggies and cashews. 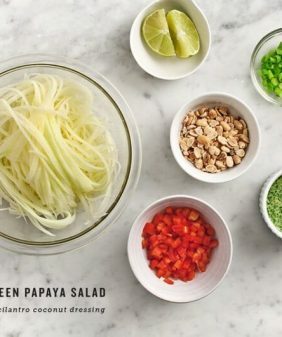 Add some cold rice noodles to make this a more filling “meal” salad… or omit the tofu to make it a lighter side dish. 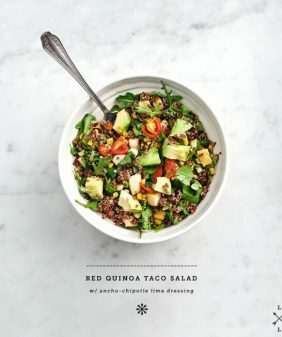 In a small bowl, whisk together all dressing ingredients. Add a bit of water if necessary to thin the dressing to your desired consistency. 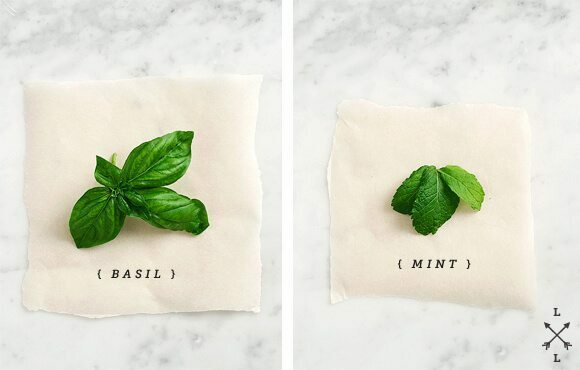 Taste and adjust seasonings. 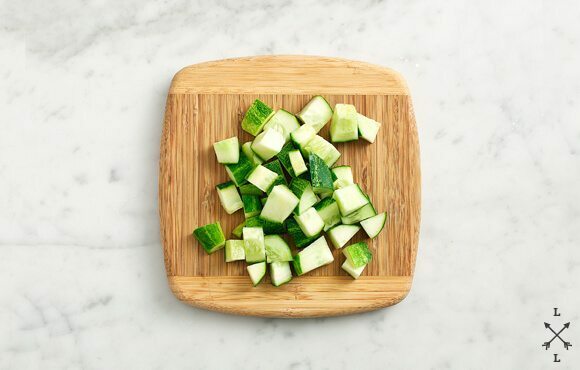 Place in the refrigerator while you chop salad ingredients. 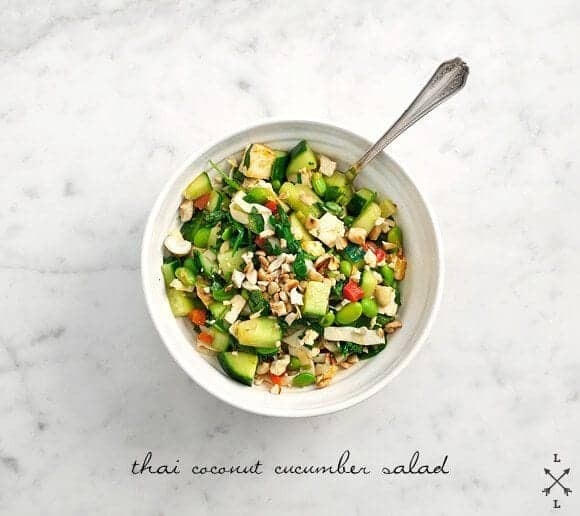 Toss all salad ingredients, except for the cashews and coconut flakes, with the dressing. Taste and decide how much or little dressing you like. Adjust for seasonings. Add the cashews and coconut flakes on top at the end so they remain crunchy. Squeeze more lime juice on top (or serve with lime slices on the side) and serve. cut firm tofu into small cubes. Arrange on foil on a baking sheet. Drizzle with olive oil, salt and pepper. Bake in a 350 degree oven for 15-20 minutes or until golden brown on the edges. Let cool for 15 minutes or so before you toss into a cold salad. Did the Arugula orzo fresh Mozzarela last night, it was so delicous. yes… a print button will be in our next round of updates (as soon as my husband Jack has some free time outside of his regular day job). Glad you liked the arugula orzo! Until the print button is working, highlight the recipe, hit control-C and then paste it into Word by hitting Control-V.
That way you don’t have to miss any of the goodness! Thai is probably the cuisine I am least comfortable cooking but this looks so wonderfully fresh and delicious that I might have to overcome my fears! I made this Thai salad for lunch today. I used fish instead of tofu. Wonderful! I’m going to use the dressing for 100 other things, or just drink it from the blender! Yum. This looks so fresh and delicious! Totally agree about the dairy comment, I love a good cheese but coconut is a fantastic substitute for milk and ice cream! I just made this for lunch! I literally read the recipe, went to the grocery store, and made it for lunch within an hour. It was delicious! Although, mine might have to be titled “noodle and cashew salad”. Because it was pretty heavy on the noodles and cashews, and I loved it! Sounds like a really refreshing idea! Coconut, herbs, and veg–fabulous. 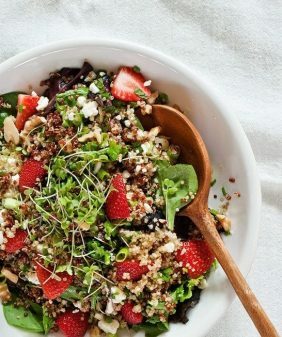 Thanks for sharing this, it looks like a perfect summer salad. Thai flavours work so well with fresh crisp chopped veg! Will def. try this one! This is my kind of salad, light and crunchy. I’ve been in a coconut loving mood lately as well, my favorite treat is coconut butter straight from the jar! 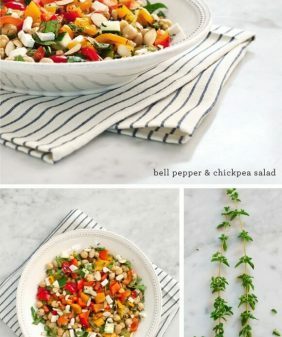 Wow I am in some good company over there on the Free People blog 🙂 This salad looks amazingly fresh and perfect for the summer! What a great combo of so many amazing flavors. Thanks for sharing and of course for your, as always, lovely photos. I just made this delicious recipe. The dressing was my favorite part!!! I loved the crunch too! So happy to have discovered this blog. You have a tasty talent! this looks extra-yummy. i’m also a big fan of thai food and would love to plan a trip to thailand soon too – it’s been on my list for way too long! These are some of my most favorite flavors as well, and I can’t help but get kind of excited when I come across recipes like this because I always keep coconut milk and red curry paste on hand. And with our state under a stretch of insanely hot weather, I could make this tonight and be thrilled to eat every last bite of it. I will try this recipe. It’s a popular dish that’s often served with a fried egg on top. OMG. Made this salad last night and again tonight. Spectacular. Anyone know the calorie count? I am guessing the recipe as is – 175 calories per serving. Sounds like a really refreshing idea!